There isn’t a row of Cornish cottages like ours anywhere in Cornwall that’s open to the public – that’s why Trenance Cottages are so important. They’re also important because they’re among very few remaining properties left in Newquay from the period before the passenger railway came in 1876. They’re certainly as significant as the Huers’ Hut on the Headland. Trenance Cottages are a modest group of Grade II Listed buildings lying within an established municipal park owned by Cornwall Council. The aesthetic quality of the cottages, set within a picturesque valley and gardens, creates some stunning views and their widely recognised 'Wow' factor. Wedding groups can often be seen using the location for their official photographs, and the paths past the buildings are walked by countless hundreds of people, locals and visitors alike, each week. The cottages are of great local architectural, historical, landscape and social significance, forming a remarkably intact group which have been largely unaltered in the 20th and 21st centuries. The modern term ‘iconic’ is appropriate as they are locally revered by a community wanting to promote and engage with its heritage. The tithe map of 1841 shows a malthouse here – on or near the site of the cottages, one of six in Newquay at this time. Malt made from barley, a key ingredient of beer, was mainly exported. We know that in 1841 Trenance malthouse was owned by the Sleeman family and Peter Hoare, an innkeeper’s son, was, for a short time, the live-in ‘maltster’. Sometime after 1850 the malthouse was converted into cottages, soon known as Vine, Middle and Rose. Each had a parlour, a kitchen, and two bedrooms, with Vine having a third bedroom and Rose a blacksmith’s forge. The valley was sparsely populated until the 19th century. From 1839 to 1881 there was a shipyard round the corner in the Gannel , and a ship’s carpenter and blacksmith were early residents at Trenance. We think of tourism beginning when the passenger railway arrived in 1876, but visitors were arriving before that. The earliest visitors came on horseback, stage-coach or by sea. By 1851 it was possible to travel from London to Bristol by train and thence to Newquay by coach. 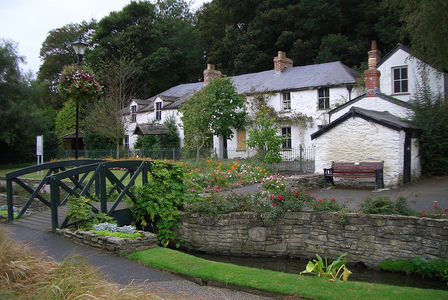 Visitors staying at Trenance Cottages included, in September 1896, a party of servants from Langford House in Somerset. In 1906 land for Trenance Gardens was given to Newquay Urban District Council by Viscount Clifden (Robartes), Silas Rickeard and others and the pleasure gardens were laid out in the 1930s. The unemployed labourers who dug the boating lake were given a pasty a day and a shilling a week. 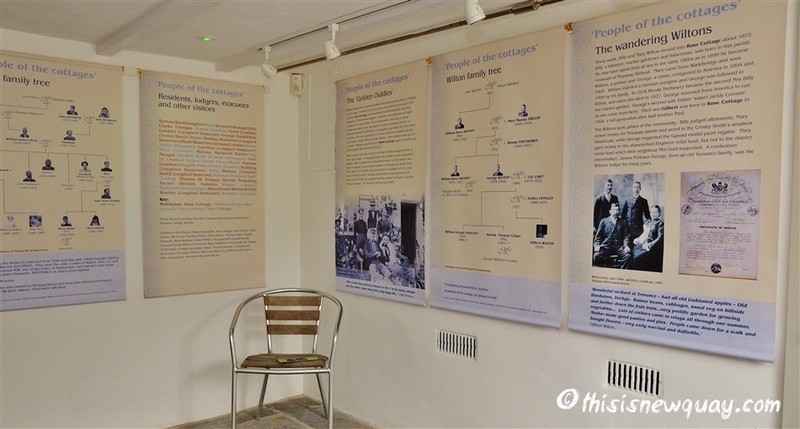 Residents of the cottages (link) since 1850, including lodgers, visitors and evacuees, number around 100, among them a ship’s carpenter, blacksmith, market gardeners and a coxswain of Newquay Lifeboat. 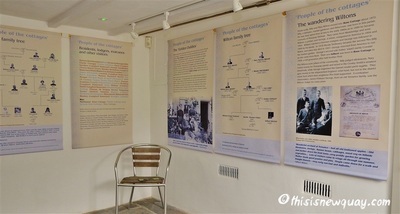 The final occupants were Gilbert Wilton and his mother Esther, and when they left in 1966, the cottages entered heritage mode, with a popular ‘museum of antiquities’ run first by the Crantock family and then Derek and Mary James. The turn of the century and Derek’s passing brought about the rapid decline of the empty buildings and the impetus for rebirth. See The Restoration Project.